The annual winter youth retreat, held at Kalahari Resort in Sandusky, Ohio, from January 5 to January 7, was focused on oneness. 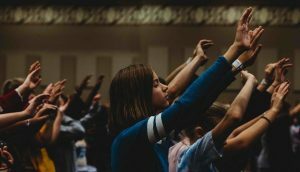 Speaker David Nasser articulated the theme at each of the four sessions: Friday night is was ‘one choice,’ Saturday ‘one team’ and ‘one life,’ and Sunday ‘one movement.’ Even the worship band of Liberty University students was called The Collective. “Kalahari One was our theme for the weekend because we wanted to condense our message to one main idea each session. We wanted each student to be able to come away with one main ‘take away’ when they leave the room,” said Zach Pinkerton, the executive director of the retreat. On Saturday evening, the students from 30 churches were invited to dedicate or re-dedicate themselves to God. About 300 students stood up. Afterwards, they were encouraged to connect with a leader from their church for support. From the various churches, about 2,300 students attended. The Kalahari Resort does not have room for that many, so they also rented from another resort nearby and bused the students and leaders to the sessions. This was also the first year that they rented the whole Kalahari Resort for a ‘Kalahari After Dark’ session where the students could experience the water park without the other guests around. Pinkerton said, “The main draw is the water parks. We use it as a tool to reach kids and their friends.” He is also the student and young adult pastor for Grace Community Church in Fremont, Ohio (Kevin Pinkerton, senior pastor). Pinkerton was a senior in high school when the outreach began in 2006 when youth pastors partnered to put on a retreat for their youth groups. The Fremont church initiated the concept when Kalahari was built in 2005. Grace Church, Wooster, joined the venture. Now Charis Fellowship and a few other congregations pool their time and resources to keep the event going. “It is all run on volunteer work. We don’t depend on any specific ministry organization,” Pinkerton said. This one event, made possible by volunteers, changes the lives of many teenagers each year. Click here to send a note to Zach Pinkerton.